In a large stock pot, heat some olive oil over medium high heat, saute the onion until starting to brown, add the garlic and next 6 ingredients (through BEP), add the broth and bring to a boil. Simmer covered for about 25- 30 minutes. Add the vinegar salt and pepper at the end. 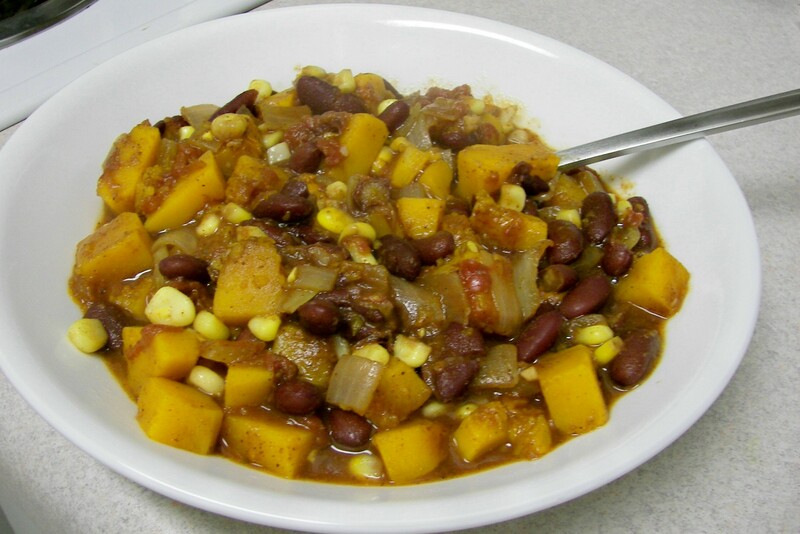 This was a great vegetarian chili, another wonderful recipe adapted from The Whole Life Nutrition Cookbook. Soak overnight, then cook as usual. Don’t drain the beans yet, you will need some of the cooking water. In a large stock pot heat the olive oil over medium high heat, add the onion and cook until beginning to brown, add the garlic and cook 1 more minute. Add the carrots, bell pepper, cumin, chili powder, and oregano, stir around and cook 1 minute. 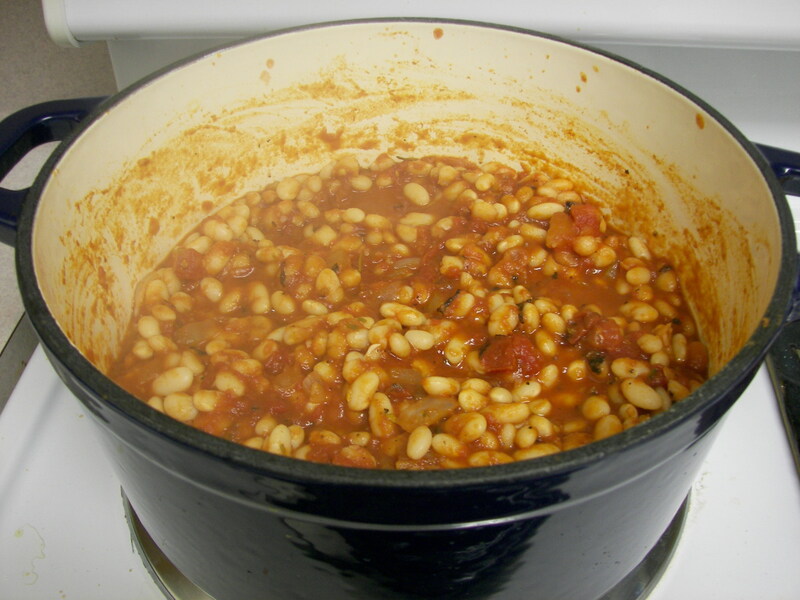 Add the tomatoes, and tomato sauce along with the cooked beans and 4-5 cups of the cooking liquid. Simmer for about 25 minutes. Taste for salt. 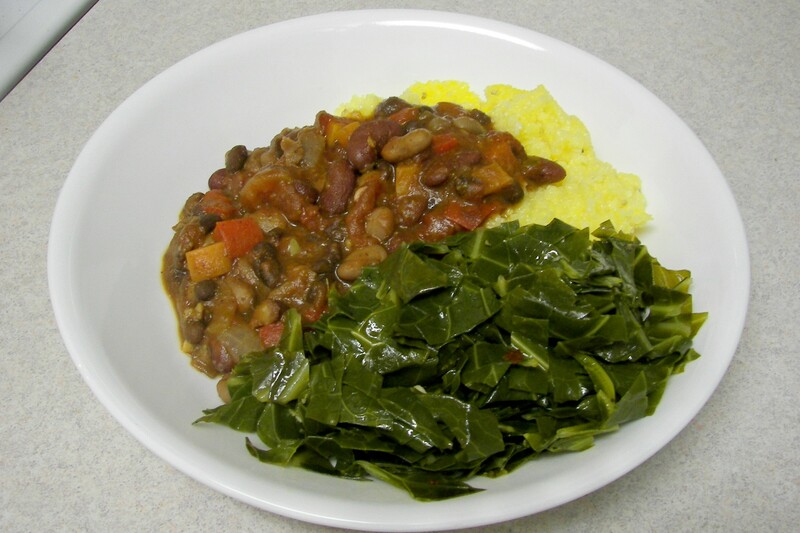 I served this with polenta and sautéed collard greens. This simple recipe is even better the next day, adapted from Martha Stewart. Drain, and transfer beans to a large pot. Cover beans with 4 inches water. Add the intact half of the onion, the carrot, celery, and bay leaf. Bring to a boil. Reduce heat, and simmer until beans are tender but, about 1 hour. Drain, and remove onion, carrot, celery, and bay leaf; discard. Heat oil in a medium heavy-bottomed pot over medium heat. Add chopped onion, the garlic, and red-pepper flakes. Cook, stirring occasionally, until onion and garlic are tender, about 3 minutes. Add tomatoes and rosemary. Bring to a boil. Add beans, and simmer, stirring occasionally, until tomato sauce thickens, about 20 minutes. Season with salt and pepper. Serve warm, and drizzle with oil just before serving. 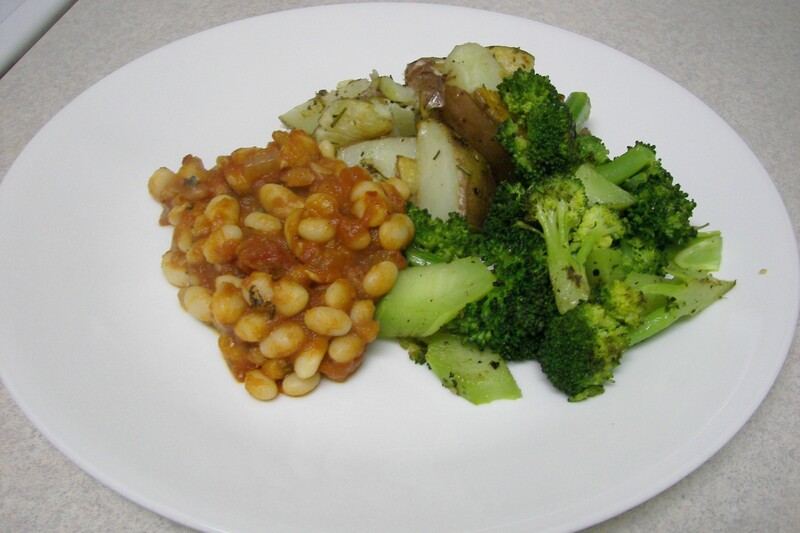 I served this with roasted potatoes and roasted broccoli. This recipe is from Feeding the Whole Family by Cynthia Lair who was my Whole Foods Production instructor at Bastyr University. That was definitely one of my favorite classes. Cynthia was a very entertaining teacher. The class combined hands on food science and then getting to eat our yummy creations, does it get any better? Place beans, water, and garlic in a large pot, bring to a boil. Cover and lower heat to simmer, cook 45-60 minutes-until tender. In a large pot, quickly dry toast oregano, cumin seeds, and cinnamon for about 30 seconds. Add oil, onion, salt and minced garlic. Saute until onion is soft, about 5 minutes. Add squash, tomatoes, and chili powder and cook until squash is soft, about 20 minutes. Add a little water if it gets too dry. Add cooked beans and corn and simmer until corn is heated though. Today was the last day for the Western Wake Farmer’s Market. I purchased some beautiful produce today. I got baby carrots, cauliflower, and sweet potatoes from Redbud Farm. From Fickle Creek Farm I got a pork loin, eggs, and some kale. I also got some local honey from another farm. I’m going to miss my Saturday morning trips to the farmer’s market. They open back up early April. Sometimes things don’t work out the way you planned them. This dinner was one of them. I make my menu out a week at a time, from which I make my grocery list. Sometimes I miss a few things. Tonight I missed many things. I will give you the recipe how I made it, not what it called for. Luckily it turned out well, this was a yummy stew. Throw it all in the slow cooker and cook on low for 8 hours. Season with salt and pepper before serving. If you happen to live near Lexington…. If not try: 1Tbsp dried parsley, 1 tsp dried basil, 1/2 tsp thyme, 1 bay leaf. 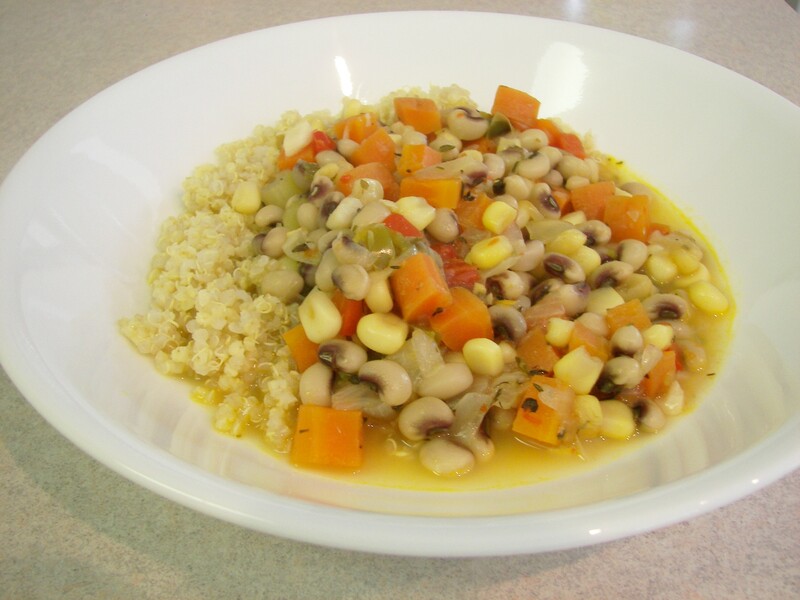 What you might have also noticed is that the soup is called 3 Bean Cassoulet, and the recipe only has 2 beans, the third bean is suppose to be dried lima beans.